On Tuesday, March 31, 2009 the crowds came from all over Belize City to Rogers Stadium, the home of softball, to watch the Belize District Primary School Softball Championship game. Three teams were vying for the title of Belize District Championship: The Salvation Army and St. John’s of Belize City and Paradise Warriors of Crooked Tree Village. The Paradise Warriors hammered Salvation Army 16 -4 and edged out St. John’s 16-13 to take the Belize District Champion. Setting goals was the first step taken this season by the Paradise Warriors. They knew from the beginning that the ultimate goal was the National Championship crown. Everyone knew what was expected of them and the team worked diligently to accomplish those goals. After sweeping the Belize District title they were on to Corozal to represent and defend their title against the Cayo District, Toledo District and Corozal Districts respectively. On Friday, April 3, 2009 they flew into action at the Corozal Stadium and quickly demolished Corozal 21-3. On Saturday, April 4, 2009 the Paradise Warriors stood a mere three games away from achieving their goals. In the first game they sprinted pass the Cayo District 15-5 and had no mercy on Toledo District, 27- 3. In the final game, again against the Cayo District, they prevailed 16-3 to clench the title. 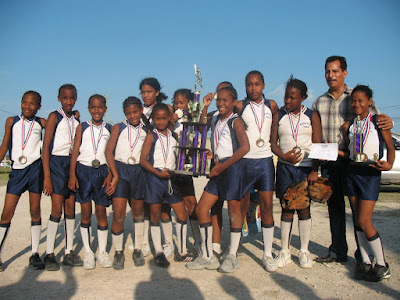 The Paradise Warriors made history by winning the National Champion of Belize Primary School Softball. This is the first time Crooked Tree Village has ever won the championship title and their coaches said that they are extremely proud of their girls, they competed like they practiced; no laziness and much concentration. The Belize Minister of Health, the Hon. Pablo Marin was on hand to deliver the individual medals and team trophy in the closing ceremonies. Amber Wade of the Paradise Warriors was crowned the MVP of the games. The health minister was so impressed with the Crooked Tree team that he gave them BZ$100.00 donations on the spot. If anyone would like to help the teams with their uniforms for next season, please send your e-mail to Verla Jex at verlajex@yahoo.com. Corrections: In my March 23 posting, I erroneously stated that Mrs. Winnie Gillett was the assistant Principal of Crooked Tree School. For the record, she is principal for one year, while Principal Verla Jex is on leave of absence. Well Well Well - Crooked Tree Village is surely making a name for itself - First Brilliant and now the Paradise Warriors made History and brought home the coveted Tropies back home. Good job Linda keep the info coming. Love them. Congratulations to the Brilliant Cricket Club and especially to the young ladies of the Village on the occasion of their National Championship Softball victory. I felt compelled to congratulate the Paradise Warriors on their CHAMPIONSHIP of the Softball competition. I am so proud of all the team members and especially the coaches for taking the time to teach our kids discipline and hard work. I also remember my days playing softball for our beautiful village. CONGRATULATIONS GUYS AND KEEP UP THE GOOD WORK!!!!! Awesome. Your pride in Crooked Tree and the girls is justified. I would like to congratulate the Paradise Warriors for an effort well done and give big-ups to Teacher George Tillett for sacrificing his neice's wedding to support and lead them to this great victory. We missed your company but am glad to know that your dedication to your school and team accomplished a great success! !Keep up the good work!!!! Cheers to you to Winnie! hi this is E.J. when i left belize principal Verla Jex was teacher verla who teachded standard 4 congratulations !!!!!!!!! your student from .....199? Emerson Hewitt Jr.